So you have a cheap electricity plan for your home, but you’re looking for ways to save even more energy and money. Just like choosing your energy company, you have the power to choose methods and products that will save you energy throughout your home. We all know the common ways to save energy like switching out old incandescent light bulbs for energy efficient CFLs or LEDs, or cleaning the filters on your HVAC system. Both of these are great, but why stop there? Installing a low-flow showerhead can save a lot of water and energy required to heat the water. The Evolve Roadrunner 2 has a built in temperature sensor so once the cold water is out of the line and the water temp reaches 95°F, it slows to a trickle. Step into the shower and pull the cord to resume the flow of water. The showerhead saves about 8 gallons of water per 5 minutes of showering and provides a good water pressure level. Your yearly savings could reach up to $246, paying for itself six times over! Plastic wrap for your windows may not seem like the most attractive look, but the savings sure do look good. A single $15 kit covers 5 windows and can save about $100 over the course of a winter. These kits are best for older windows but won’t help much if the window frame is of poor quality. 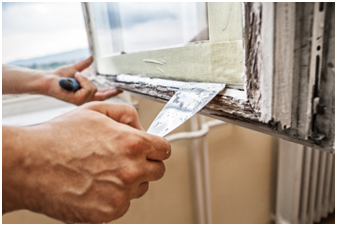 Replacing old windows isn’t cheap, but it will definitely reduce the energy costs associated with heating and cooling your home. Replacing 8 windows can cost up to $3550, but you’ll save up to $465 each year in energy costs. It could take up to 10 years before the windows cover their cost, but in the meantime, your home will be more comfortable. Programmable thermostats are excellent ways to reduce energy use. You can set the times you want it to run your HVAC system and when to turn it off. Leave it off overnight and while at work, but let it warm or cool your home from the time you get home from work and when you get up in the morning. Learning thermostats will program themselves according to your schedule and some can be controlled by Wi-Fi apps on your phone or tablet. A Nest Learning Thermostat can pay for itself within 5 years, depending on how much energy you save. Insulation is important to maintain home comfort and prevent climate controlled air from escaping. One of the places it escapes from most is the attic. Insulating the attic will keep your home more comfortable, and it costs between $110 and $167 to insulate 300 square feet. The amount of time it takes to cover the cost in savings varies quite a bit, though. Sitting under a ceiling fan in the warmer months will allow you to set your thermostat a few degrees higher. The fan uses the wind chill effect to make you feel cooler than you actually are. In the winter, reverse the fan’s spin direction and run it at a low speed to help circulate the warm air that gathers up at the ceiling. Refrigerators are another expensive item to replace, but they could net you some pretty cool savings. If the fridge you replace is more than 25 years old, you’ll save about $150 per year in energy. The amount of time it takes to recover the cost varies based on how old your current fridge is and how expensive your new one is. A light left on is a big waste of energy. Sometimes we forget to turn them off when we get distracted by something and leave a room, sometimes we don’t realize they’re on, like if the room is already well lit. Children have a tendency to not turn off the lights when they leave their room, bathroom, or playroom, and you may find that there are lights on all around the house because of this. Some parents become frustrated seeing all these lights left on because they know that it’s like throwing money away. Instead of scurrying all over the house turning off lights all day, investing in motion sensor switches will eliminate the hassle altogether. Motion sensor switches are easy to install, and are relatively cheap. Each switch will cost between $20 and $40 and can be found online through sites like Amazon or at local hardware stores. There are two different types of switches: Occupancy and Vacancy. Occupancy switches turn themselves on as soon as they detect movement. These are ideal for bathrooms and laundry rooms. Vacancy switches do not turn themselves on when they detect movement; you must turn them on like any other standard light switch. The switches are good for children’s bedrooms, as they won’t automatically turn on should you need to check on your child at night and don’t want to wake them. They are also ideal for rooms where pets frequently enter, so they don’t constantly trigger the lights. Both of these switches will turn themselves off after a set amount of time has passed with no movement. The timeout duration can be set to between 1 minute and 30 minutes, typically. In playrooms, a short timeout time is best, bathrooms could be set to 10 minutes, and bedrooms could be set to 15 minutes. Even if a light is neglected and not turned off, the automatic shutoff will save a lot of energy versus the light staying on for several hours at a time. Installing LED light bulbs in conjunction with these motion switches will further decrease your energy use. Decreasing energy use is a surefire way to save money on your electricity bills, but switching to a new energy provider can also help. Shop Houston Electricity will help you compare the rates of several energy companies so you can get cheap electricity. You have the power to choose your own Texas electricity provider, so switch now and save!